Silt Fences are temporary sediment control devices that are designed to prevent the release of silt from a construction site. Silt fence is typically supplied as rolls of permeable fabric stapled to wooden posts. These are installed along landscape contours to collect and/or filter sediment from sheet flow runoff. 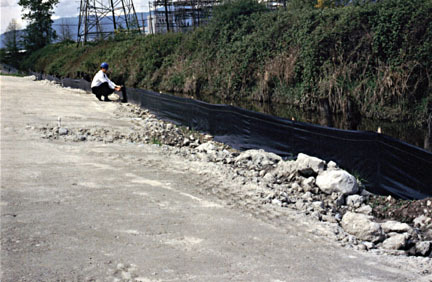 Silt Fences prevent silt contamination of sensitive areas such as neighboring properties, streams, and catch basins. A properly installed and maintained Silt Fence will collect silts before they can cause contamination requiring expensive clean up. Silt Fences create a small puddle behind the fence that acts as a "stilling basin" allowing silts to settle. Silt Fences are most often used on sites where the soil has been stripped of natural vegetation. The bare soil is easily eroded and can lead to the loss of large quantities of silt during a rainstorm or other run-off event. Looking for a product that separates silt from water?